In this tutorial I am going to explain how to download and Install MongoDB on Windows 10/ Windows Server 2016. Following are the steps you need to follow in order to install MongoDB on Microsoft Windows 10 / Windows Server 2016. Create Data and Logs Folders. Start MongoDB from the Command Line. Setting up MongoDB as a windows service. Add MongoDB binaries to the Windows PATH variable. The download for the Microsoft Windows for the MongoDB comes as a .msi installer. The .msi installer also includes all other software dependencies that need to run mongodb on windows. 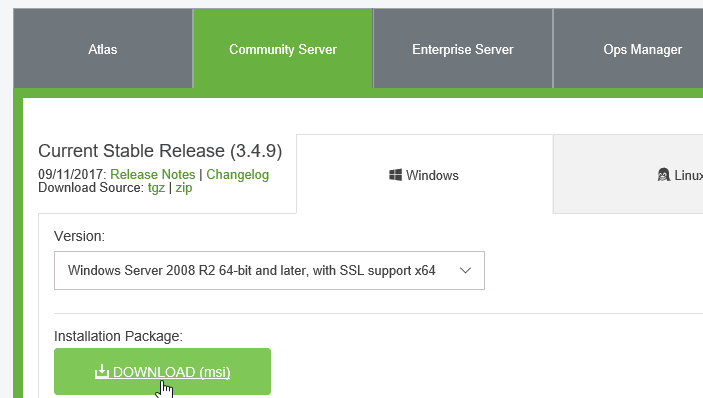 Go to mongodb download page, select the community server and download the .msi installer to your computer. Once the download is finished, run .msi file to install MongoDB in Windows. If you go with the default installation options, mongodb will be installed to the "C:\Program Files\MongoDB" folder. We need to create the Data folder for the NoSQL database server as well as Logs folder. MongoDB installer does not create these data directories, so we need to create them manually. We need to create the Configuration file for the MongoDB Server. Create a new file called 'mongod.cfg' at 'c:\mongo\' (Look for the file extension, by default windows hide the .txt file extension) and add following configurations to the configuration file. At this point we are ready to start MongoDB server on windows using the windows CMD. To start MongoDB we need to run the mongod.exe which is in the bin directory of the mongodb installation folder. The --config option need to specify the path to the mongod.cfg file. It is easy to manage MongoDB database server if you configure mongodb as Windows service. To create windows service, we use the same command we used to start the MongoDB server with --install flag. Now if you go to the windows services manager, you will see the "Mongo DB" service. From the services manager, you can set "Startup Type" to "Automatic" to start MongoDB service at system reboot. We can now start and stop mongodb service from the command line with the net command. Add MongoDB binary location to your windows system path so you can start mongodb shell from the windows cmd without having to specify the full pathname. The binaries are located inside the bin directory under the installation directory. Go to Control Panel > System and Security > System > Advanced System Settings and Click Environment Variables. Under the system variables, edit the PATH variable and append the full path to the bin directory. With PATH variable is set, you can simply type mongo in the windows command line to access mongo shell.